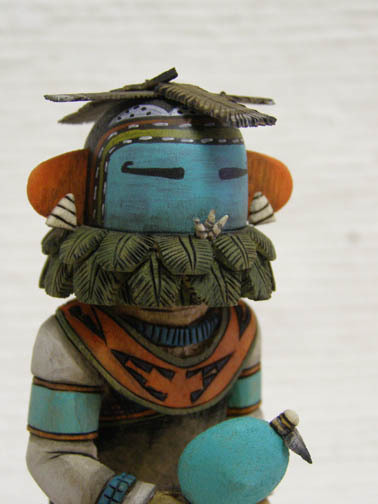 Katsina dolls are an important and cherished part of the Hopi culture. 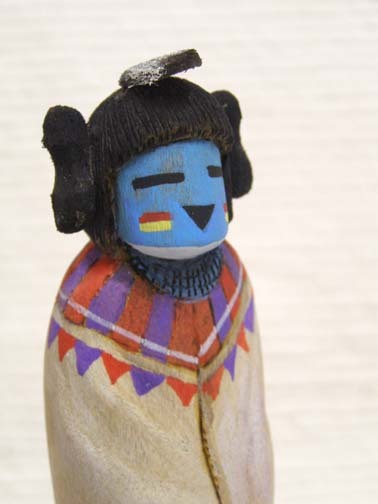 These dolls are representations of one of the hundreds of Katsinam, or Hopi spirit guides, who are believed to live primarily in the San Francisco Peaks of Arizona. They descend from the mountains as the winter season wanes to help villagers tend to the fields, care for the children, and tackle any other major task required to encourage the community and land to flourish. The Katsinam stay through late July when the planting and growing seasons have ended. 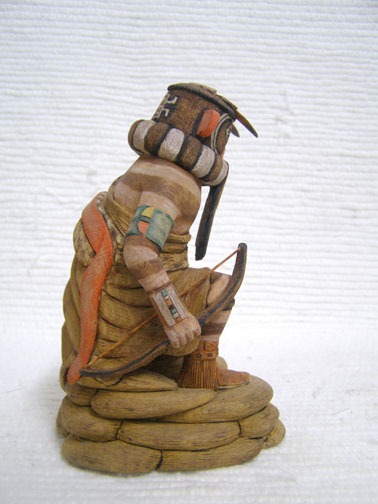 At that time they take their leave of the Hopi and return to their home in the mountains of Arizona. 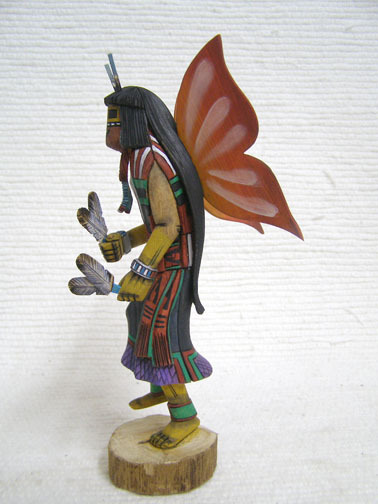 During the time that the Katsinam are visiting the Hopi villages, numerous dances are held to both celebrate a particular natural event or remind the people of the village of the significant presence of the Katsinam, and to help the children learn about these sacred beings and what each of them represents. 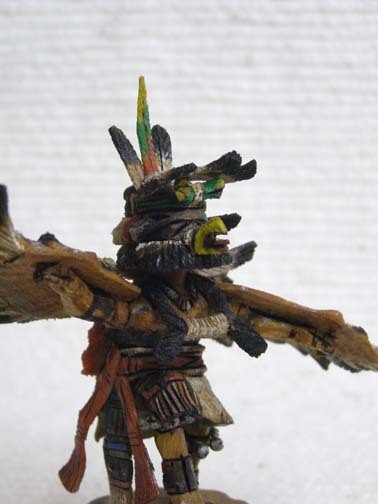 During these dances, the Hopi men will don costumes and will "personate" an individual Katsina, which is represented by a specific mask, color patterns and physical characteristics. 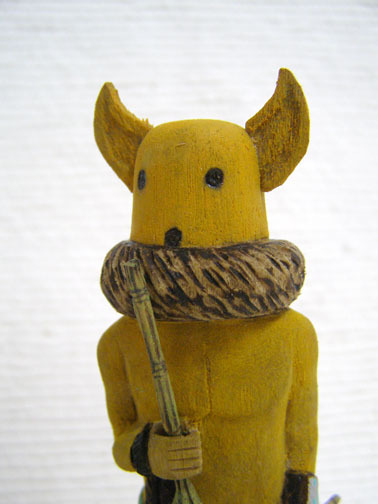 Katsinam are carved, to represent a specific Katsina and to help the child become acquainted with that particular spirit. 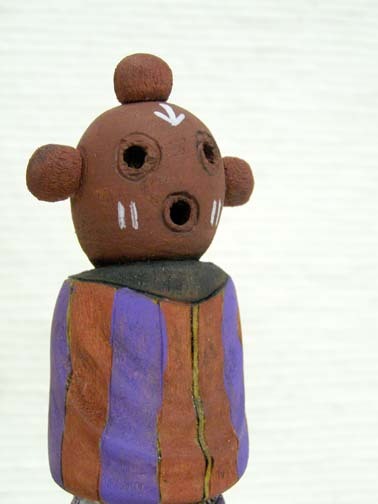 These mini carvings, referred to as dolls, are carefully carved from the strong, light root of the cottonwood tree and then painted with the particular colors of the specific Katsina the doll represents. 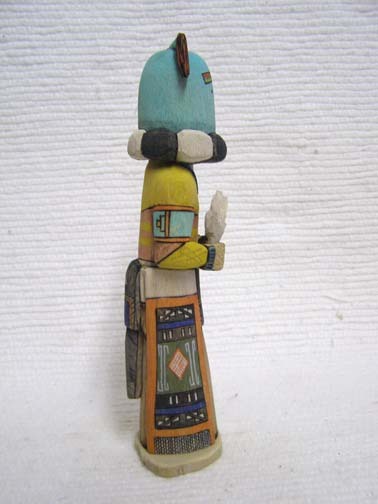 Native American Hopi Carved Navajo Maiden Dancer Katsina Sculpture by John Fredericks This Old Style Navajo Maiden (Qoia Katsinmana) is the female partner to the Qoia or Kau-a Katsina who was an old time Navajo Katsina. He sang in the Navajo language and appeared in regular Katsina dances, the final time being at Mishongnovi in 1914. Neither the maiden nor her partner dance any longer. 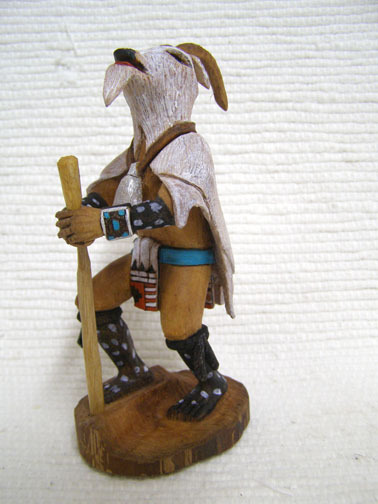 $120 6.5"
Native American Hopi Carved Miniature White Ogre (Wiharu) Disciplinarian Katsina Doll by Milton Howard The White Ogre (Wiharu), and the Black Ogre (Nata-aska) are disciplinarians who appear around the time of the Powamuya Ceremony. 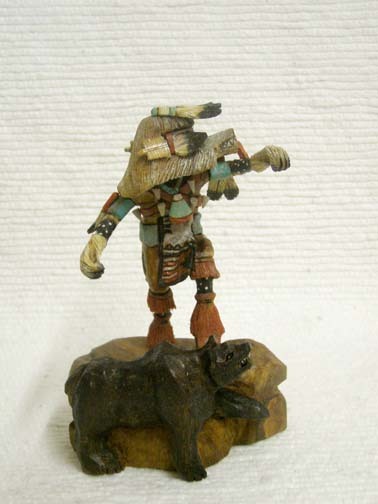 Both carry a saw (sometimes a knife) as well as a bow and arrows for hunting. Their outstanding feature is their long, flapping jaws, which they can clack quite loudly. 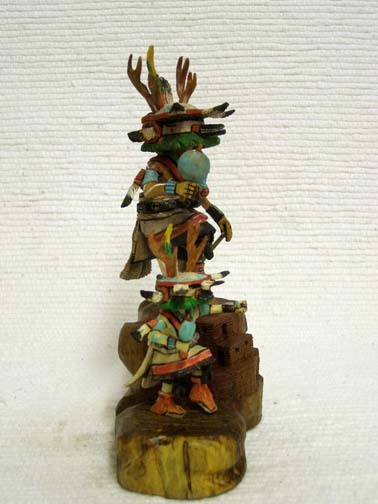 These Katsinam reinforce the Hopi way of life to the children of the Pueblo. 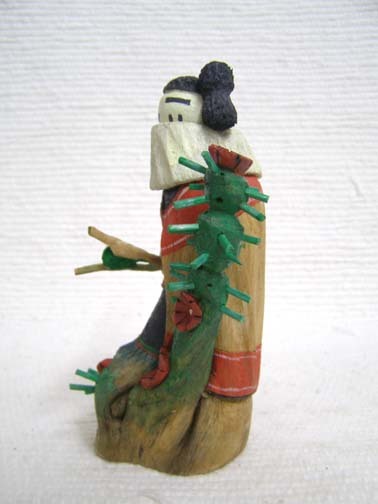 These Ogres accompany Soyoko on her trip to collect food from the children. As a means of discipline, children are told the Ogres can swallow them whole, unless they are good little children. 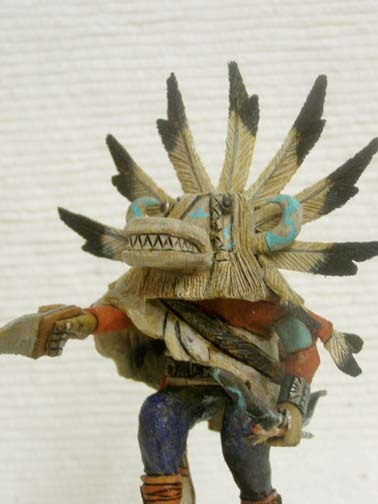 The fierce and threatening behavior of these Katsinas strikes fear into the children, but they are eventually saved from imminent danger by the people of their Pueblo. Anglos would call these Katsinam the bogeymen.